Dear Robinson Film Center Supporters, writes John Grindley. "The Robinson Film Center just received word that Governor Bobby Jindal has announced that he will veto $500,000 in supplemental appropriations for RFC programming and operations. This is a major decision that we need your help to overturn. Governor Jindal announced these line item vetoes, but has not signed them into law yet, but he will in the next couple of hours. I’ve been advised that we should contact Louisiana Economic Development Secretary Stephen Moret. He has the ear of the governor and if he wants it in, then it will stay in. Please direct your calls/emails to Moret. His office number is 225.342.5388. Or contact his assistant, Lisa.Bryant@la.gov." 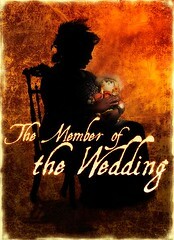 Casting for River City Repertory Theatre’s upcoming production of “The Member of the Wedding” has been completed, says Patric McWilliams. The rarely seen American classic by Carson McCullers opens July 16 at the Scottish Rite Cathedral and runs through July 20th. Lexi Langs has been cast as Frankie Addams, the tomboy bursting with adolescent dreams. Langs has appeared at the American Girl Theatre in NYC, the Orlando Shakespeare Theatre and the Orlando Repertory Theatre. Completing the cast is Benjamin Maxey, Leonard Yoakum, James Monk, Jennifer Warren, Stan Blackshire, Nicki Daniels, Charity Schubert, Catharine Barbaree and Lorna Dopson. Box Office opens Mon, June 30th. Hours are 11 a.m. to 5 p.m. Mon through Sat. Ticket prices are $35.00 for Orchestra and Upper Center Tier and $25.00 for Upper Side Tiers. Reservations may be made by calling the theatre box office at 318-868-5888 or tickets may be purchased at the box office located at 2829 Youree Drive, Suite #4. In the independent movie The Visitor we watch, with glacial surety, the metamorphosis of a burnt-out case. The comfortably numb life of the protagonist, a college prof, is galvanized by his experience with an immigrant family in NYC. The rag of contention seems to be post-9/11 immigration, yet The Visitor is about the Time Remaining and the comfortable class. It is well made, if ponderous. While we've dined at Abby Singer's Bistro (excellent portobello mushroom sandwich) and been to meetings at Robinson Film Center, Shreveport's new art movie mecca, this was our first moviegoing experience. We found the seats superb and the company sympatico. And we found weekend parking on Texas St to be entirely easy. 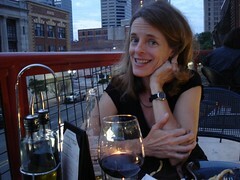 The RFC experience gave us a whiff of life in Austin or Dallas but with a serious discount. We're planning to see the well-recommended Son of Rambow this week. 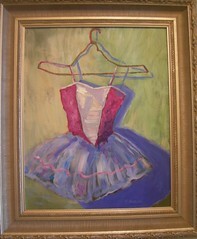 Lisa Smith has exhibited masterly paintings at Artspace over the past several years. She has also won notice for altered art fabric creations at her site IVANandLUCY.etsy.com. Now Smith has found an old letter press and has designed and manufactured a new line of artful goods. 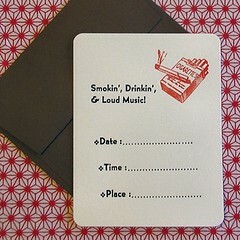 Found at PressaRussa.etsy.com, the Smith wit is well-employed in these note cards, invitations, journals and the like. Smith archness in paper goods includes logos such as: "Join my damn book club," "Watch more TV" (with full irony) and "Piss off!" At both sites Smith demonstrates an impeccable sense of graphic charm and balance. And her vinegary logos seem to me to be happily contrary to what you'd expect to find on etsy.com. Artists Bob and Judy Horne are among many arts and crafts vendors who will be in the shade near the museum in Gilliam, La. The event takes place from 9 am to 4 pm on Sat. "Go north on Hwy 71, turn right at the sign to Gilliam," she says. "Or drive north on Grimmet Drive and bear right onto Hwy 3049." Please come see our show tonight at Actor's Cafe, 1401 Fairfield Avenue. We will have two performances: 8 p.m. and 10 p.m. This is an all-ages venue and they also serve food! Your patronage of this event helps us keep a free, open, and supportive place for belly dancers of all styles and levels to perform. 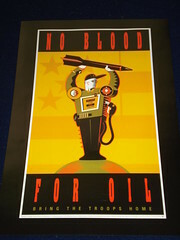 Blood & Oil is a political screed on America's addiction to petroleum. Having watched the trailer, I wonder whether it is going to be useful for a news-minded person. It might be the sort of consciousness-raising piece that is appropriate for students or others who routinely ignore world news and analysis. See the Minicine-sponsored movie at Columbia Cafe - ordinarily closed on Mondays - at 8 pm Mon, June 30. Door opens at 7 pm. Pam says . . .
It’s an Opening! It’s an Exhibition!! It’s a Party!!! 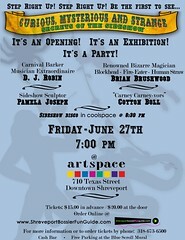 Fri, June 27, 7:00 pm @ artspace, 710 Texas Street, Downtown Shreveport. For more information or to order tickets by phone: 318-673-6500. Cookie magazine is for Etsy mommies. 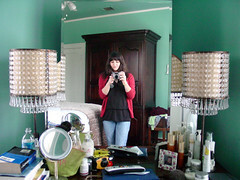 This month it presents Shreveport painter Rachel Stuart-Haas as an avatar of decor. 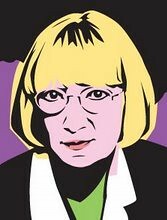 Happily, Stuart-Haas is low-key and ha-ha about the interview in the Nesting blog and the success of her bold choices in paint. She even admits to friends that ," I'm not so sure about the part where we vacation all the time in the Caribbean. But that's ok with me if we did!" Big Willie Style is the most daring show you'll see in Shreveport this summer. It is raucous and it clicks, cue after cue. The hip-hop dance is fabulously executed but the Shakespeare is problematic, imho. The key to running with the Bard is the show's program. There you will find a scene-by-scene listing of the play being referenced. See my review for more background. Times reporter Alex Kent wrote a review, too. The cast is talented and endearing. Bring your camera for after-show snaps with these young stars. They've brought an amazing amount of energy to the stage. Dan Sanchez and his Kings of Pleasure will entertain on the Barnwell's riverside patio for the closing edition of Hot Jazz on the Red, says Freda Powell. 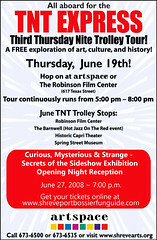 The free show takes place from 6 to 8 pm Thurs, June 26. If you've got a new Mac or are thinking of getting one, the Shreveport Mac Users group (SMUG) may be a good resource for you. It's a group formed by Thomas Avallone, of Maccentric, to bring in speakers and give workshops as well as give mutual support. Meetings for SMUG have a new home. 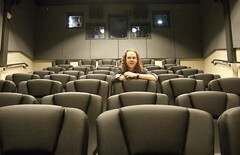 Says Avallone, "Thurs, June 26, we will meet on the second floor of the recently opened Robinson Film Center at 6:30 p.m. In keeping with the spirit of the venue, our featured presenter, Grant Chapman of Tyrosys Corp, will demonstrate the finer points of importing and editing video with iMovie '08. 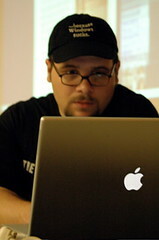 He will also discuss how to prepare and export the finished project to iDVD '08 and YouTube. WiFi will be available. Admission is free. No outside food or drink, please. Abby Singer's Bistro will be open to satisfy your refreshment needs. We have been advised by the RFC that ample parking will be available and security will be on call. If you should have any questions or concerns, please do not hesitate to let me know. To RSVP for this meeting, please click here. Overall I am very pleased and impressed with the Clyde Fant Recreation Plan. You have done a lot of work and made valuable use of the input so far. I approve of almost everything with a few minor exceptions. First, though, I want to amplify your plan on two points that were not emphasized. The Preston Ave trail connection is very important because it serves the large neighborhoods of Shreve Island, Broadmoor and Broadmoor Terrace. Don't just think how they would access by car and park but how they can enjoy the Parkway by bike from their doorstep. Currently you have to carry the bike over grass because of goathead thorns to/from the parkway and ride along a shoulder of the Parkway that jars your teeth because of deep cracks and is full of debris. Then you either ride on a bumpy slab sidewalk (technically illegal) or share a high traffic two lane that people do 45 and 50 on which is not appealing to the casual recreationalist. 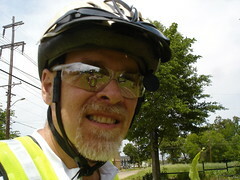 Please extend the trail to Captain Shreve. Just take that sidewalk and overlay with asphalt. Next, there is the underpass that leads from the bike trail at the wooden bridge, under the Parkway to the Coats Bluff area. Please fix the drainage there too, like the underpasses at the Disc Golf Course. Did I understand that an extension of the trail to C. Bickham Dixon would not be open to cyclists? Even on blacktop? Not good. This Greenway has potential as and alternative transportation corridor but it needs to serve neighborhoods at LSUS and Shreve City Shopping. It is not that much to ask that it be functional as well as recreational. Think of students and shoppers, Farmer's market customers and Festival goers not having to use their cars and having such a pleasant greenway to use. The only proposal I really disagree with is doing away with the informal parking across from SciPort. First, there is not enough parking in the area. The Railroad is famously uncooperative about giving up their property, it is the best parking for the interactive fountains, and as a canoeist, I can carry by boat, paddles and life jacket to the dock and launch in one haul. I couldn't do it from where you propose. Jon Schleuss is a Tibetan prayer flag, oscillating in the streaming media wind. A Centenary college student, he has blazed a trail from graphic arts to radio management to writing programming code. He's working at RFC, he's producing a show at Actor's cafe or H & H Lounge, he's giving someone a wink and smile at Starbucks, but mainly he's an online force majeure: snaps on flickr.com, Arabian Nights on twitter.com, explanations on blogspot, fun on Facebook, etc. As much as I like watching him run from pursuit to pursuit, there is one big Schleuss thing that impacts my life: the rockin' indie music that I listen to on KSCL. Moldy music mostly does not inspire me. The CMJ charts are the sound of the moment. Derivative and flawed, yes, but fresh. Surely faculty advisor Michael Laffey and other students have helped keep KSCL operating over the summer, but I followed the passionate Schleuss as he clamored for more media. If you haven't managed to waggle your dial to 91.3 fm, please spritz your life with an alternative to the local and predictable. And one of the shows you may catch is the vibrant Voice of Schleuss. Houston is like Shreveport's big sister. At over 2 million city population and 5.6 million metropolitan population, Houston certainly is a big sis. 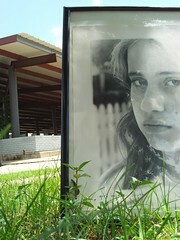 For many years the vast, anonymous suburbs of Houston and the traffic seemed to make her the sibling not to emulate. Today we can see that like most sisters, there are good qualities as well as the dubious. One of the surprisingly cool facilities that make Houston worth watching was recently opened. It is a downtown park - adjacent to the convention center - called Discovery Green. 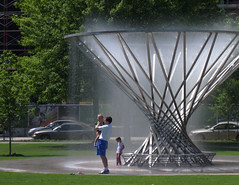 It has a bit in common with Riverview Park: the interactive fountains. Beyond creative ways with water, however, Discovery Green offers a ton of stimulation. * Approximately 630-car underground parking garage. In almost every item above there's a thought-provoking discussion possibility for Shreveport. In this era when the overall city plan and the Clyde Fant Outdoor Recreation Plan are under discussion, let us be open to our siblings' better ideas. Comedian George Carlin has passed, says the NY Times. He was noted for "groundbreaking routines like “Seven Words You Can Never Say on Television,” among many routines. Evidently he learned most of those words in 1956 as an airman stationed at Barksdale AFB. An "Open House" for the Clyde Fant Parkway Recreation Plan will be held Thurs, June 26, from 5 to 8 pm at the pavilion at the Stoner S'port Marina, says city planner Tim Wachtel. This is not a "meeting," notes Wachtel, so you can stop by at your convenience to see the plan, discuss your ideas, and "vote" on what you like and don't like. This draft is intended to be a starting point for a community discussion of the future development of outdoor recreation along the Clyde Fant Parkway. We care what you and your neighbors think, so let us know! Caddo art teachers from all levels - elementary, middle and high - will show their work at Barnwell Center beginning June 25. This annual exhibit has been held at LSUS Gallery in recent years. The reception will be on Sun, June 29, 2 to 4 pm. Among the many teachers is professional painter Frances Fontaine. She emailed her friends that "I would love for you to come and see our work. My work is priced very low so it will be a good opportunity to pick up one of my paintings for under $200 if you so desire." Having seen her excellent pieces at West Edge Artists Co-op, I can heartily recommend this opportunity. The Centenary College Big Band Jazz show led by Bill Causey Jr., Tues, June 24, 8 p.m., will be held in the Hargrove Amphitheatre, aka the Band Shell. Karmyn Tyler, Miss Louisiana 1995 and an actress-singer in Los Angeles, will be featured vocalist on Charade by Henry Mancini and Mangos by Rosemary Clooney. Tyler will be joined by Jennifer Dowd and Elizabeth Wuellner to form a trio and perform songs by the Andrews Sisters including Rum and Coca-Cola and Boogie-Woogie Bugle Boy. Additionally, Tyler is offering an acting workshop at the college. Call Jennifer Dowd at 318-865-5202 for more info. Concertgoers are encouraged to bring seat cushions, lawn chairs and picnic baskets for the evening. Additionally, the Summer Band musicians will provide the music on July 4 before and during the Fourth of July RiverBlast 2008 fireworks event on the Shreveport riverfront and broadcast on KSLA-TV. The band performs at 8:30 p.m. and 9:20 p.m.
Shreveport-area green-minded people have an opportunity to coalesce in the upcoming Everything Green Expo, says Kathryn Bloomfield. Its purpose is to get out the Green Message in all of its various forms. Mayor Glover is endorsing the program and is scheduled to speak at the show. 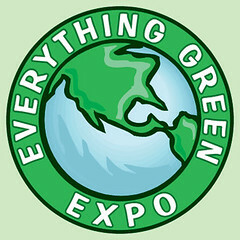 The website - which is continually being updated as new speakers are added - is http://everythinggreenexpo.com/. Caddo Parish Animal Shelter and Robinson’s rescue have been asked and agreed to participate with the theme being Recycled Pets and Furry Friends. A presentation on the Dog Park is being scheduled. The expo is scheduled for Aug 22 – 24 at the Shreveport Convention Center. Friday’s speaker slots are full and are geared to green building. The weekend schedule of speakers is being structured towards the general consumer. It will include the “how-to’s” of recycling ala our new blue cans, how to lower energy bills, organic gardening, green roofs, water reclamation from rooftops and gutter systems, xeriscaping, etc. There’s also to be a message of no more litter. Fairly recently, an expo in a town in Arkansas of similar size to Shreveport brought in over 60,000 people, says Bloomfield. The expo presents a great opportunity to reach the public to obtain feedback, she points out. With the Pyramus and Thisbe scene from Midsummer Night’s Dream did the Big Willie Style troupe reach its apex on opening night. Actors Kent Bernard, John Chambers and Harvard Taylor relaxed and played the comedy apace. The audience was theirs. worked like demons to hit their Shakespearean marks. Their dance and rhyme spinning was expert and gymnastically entertaining. And the ability to jump from hip hop to Shakespearean dialogue was impressive. Rarely have I seen a young cast move so smartly from cue to cue, coordinating their dance and dialogue. It was a balanced cast, too: in their own turns Christina Taylor, Courtney Herron and Wanetah Walmsley showed themselves equal to the standards set by Bernard, Chambers and Taylor. Actor James Palmer won special attention from the audience by his emotional fluency. The dance cast was no less entertaining. Emma Busi and Michelle Loridans brought balletic grace to the stage. Chelsea Liles, Luke Sexton and Lin Rivers added a sense of humor in addition to muscle in their spinning and spazzing. But much of the Shakespeare was strident. Why were so many of the scenes chosen for the Big Willie Style review focused on murder, torture and perfidy? In their Elizabethan renditions, the actors frequently moved from capable recitations to histrionics. In the bloody and dreadful scene from The Tragedy of Titus Andronicus there was nothing but stress and rhetorical excess. Additionally, a technical challenge reared its head on opening night: the actor’s mics were so efficient that when dialogue reached peak intensity the volume was annoying. Big Willie Style performances continue this weekend and next. Please see the Gilbert & Sullivan Society web site for tickets and times. An earnest group of players from Natchitoches created an ode to the bard 4 seasons ago in order to fulfill their studies at NSU. 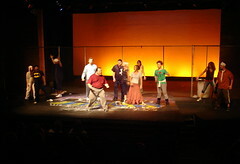 To the credit of creators James Palmer and John Chambers and choreographer Wanetah Walmsley, the show - Big Willie Style - has subsequently been produced annually. This year the Gilbert & Sullivan Society of North Louisiana has chosen to present the hip-hop Shakespeare production at Marjorie Lyons Playhouse, Centenary College. John Chambers says of Big Willie Style, " We believe that it is something fresh and something that Shreveport has never seen before. It is a true 100% Hip Hop show with 100% Shakespeare. A blend of the bards best with some of the finest in Hip Hop and of course some fly dancing." Rho Omega has built a home for blues and funk with the annual Let the Good Times Roll Festival. 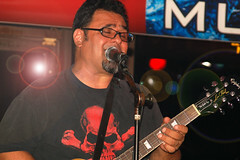 - Fri, June 20, the music begins at noon with Dorsey Summerfield. - By 8:45 in the evening you can catch powerful local singer Jimmy Lynch. - Sat, June 21, the music returns at noon. - At 7 pm you can catch Windstorm; they're as hot as ever, I'm told. - About 8:15 the Crescent City horns of the Hot 8 Brass Band take the stage. If you haven't done the second line lately, this will be the right occasion. 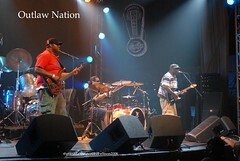 - ConFunkShun will close it down Fri; they begin at 10 pm. - Sun, June 22, the show continues at Festival Plaza. Music begins at 2:30 pm with praise dancers. The eve will close with the Bar-Kays at 8:15 pm. Shreveport Public Assembly & Recreation is preparing a plan for outdoor recreation along the Clyde Fant Parkway, says planner Tim Wachtel. After considering public comments from our Recreation Master Plan and working with a panel of local experts in recreation, conservation, special events, zoning, and history, we prepared a 2nd Draft for public comment. You can see it here. 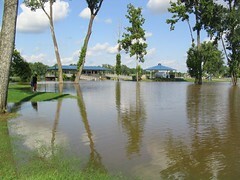 Eds note: As a person who enjoyed the brief glory days of Veterans Park amphitheater (concerts by Stevie Ray Vaughn, Heart's Island, etc) I have been dismayed by the city's inability to pick up the pieces. This plan proposes that part of the land be made into a Dog Park, which is savvy. Overall, I think the Fant Parkway plan is an enlightened and workable document. We are also having an "Open House" for the Plan on Thurs, June 26, from 5 to 8 pm at the pavilion at the Stoner S'port Marina. This is not a "meeting," so you can stop by at your convenience to see the plan, discuss your ideas, and "vote" on what you like and don't like. It is a free exploration of art, culture and history that takes place via air-conditioned trolleys. The tour runs continuously from 5 to 8 pm. Linden, Tx, is home of the annual T-Bone Walker Blues Fest, reminds Bruce Flett. 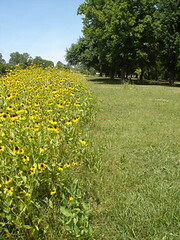 Linden is about 15 miles north of Jefferson, Tx. AJ and the Two-Tone Blues Band, Betty Lewis and the Executives, Pocket Change and the Bluebirds. Also notable: Wes Jeans, Gary Nicholson, Marcia Ball and Delbert McClinton. Flett adds, "Meanwhile, Buddy rolls on tour with Kenny Wayne Shepherd & Hubert Sumlin. Tonite at the House of Blues in Cleveland. Buddy gets back end of June, and plays with us at Jayne Marie on Cross Lake on July 4th." Artist and arts educator Nancy Walkup, once a Shreveporter but a citizen of Denton, Tx, for years, is in Japan with a group of scholars by virtue of a Fulbright grant. She's shooting photos, jumping on trains, grokking the signs and throwing herself into the waters of Nipponese culture. Her visit to Japan may ultimately have a widespread impact on the US since she is editor of SchoolArts, a national magazine for arts teachers. See more at her blog, Schoolarts to Japan. 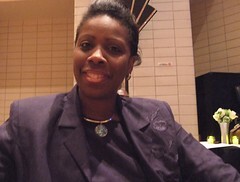 The Deadline for Fellowship Awards for 2008 has been extended to July 14, 2008, says Vickie Marshall. Access the guidelines and application form under Resources and Forms at Shrevearts.org. Recipients who received a Fellowship Award in 2000 are now eligible to apply again in the same discipline. Curious, Mysterious and Strange: Secrets of the Sideshow is a multi-faceted Exhibition that recalls the promotion of the strange and mysterious secrets within the Sideshow tent at the traveling circus, says Pam Atchison. The Exhibition features large mechanical sculptures created by Aspen, Colorado artist Pamela Joseph. Her installation of moving sculptures provides a contemporary twist to a dying art form. Joseph’s giant sculpture, The Lady Sword Swallower, will provide a riveting experience for viewers who seek the “curious”. Joseph will provide a tour and talk about her work on the opening day, Saturday, June 28, at 1:00 p.m. at artspace. One of the last known and producing Sideshow Banner Artists, Glen Davies, will exhibit his work and provide a one-week Artist’s Residency, July 14 – 18 at artspace. Davies is from Chicago and has been producing Circus Banners for years. 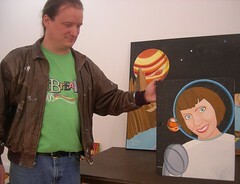 He will create an ARTSPACE ALIVE banner featuring the “SPIDORA” curiosity during his residency. On Thursday, July 17, Davies will provide an Artist’s Talk and Tour at 6:00 pm, as part of the free monthly, TNT EXPRESS night at artspace. Davies has been designing and painting Sideshow banners since he ran away to join the circus in the summer of 1973. The Exhibition also includes a collection of large-scale vintage banners owned by George Douglas, most of which are for sale. The works in this collection were created by Fred G. Johnson, considered to be one of the finest Sideshow banner painters. His 65 year career of banner painting created many works of art and his banners are prized around the world. Johnson’s ingenious techniques for painting a banner inspired generations of young painters, including artist Glen Davies, whose works will be shown as well. Curious, Mysterious and Strange will be open Tuesday through Saturday, 10:00 am to 6:00 pm. Artspace will be closed on July 3 and 4 in observance of the Fourth of July, but will reopen on Saturday, July 5th. The late Elemore Morgan, Jr, won acclaim from Paris to Los Angeles as a landscape artist. 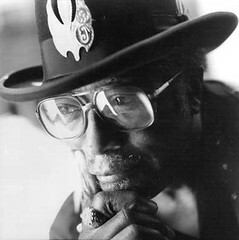 He is considered one of the Bayou State's most soulful and notable artists. A teacher at USL from 1965 to 1998, the painter was best known for rendering the rice fields of Vermilion Parish in acrylic, on masonite board. He died last month at age 77. Morgan is not so well known in North Louisiana. In fact, when it comes to recognizing accomplished Bayou State artists, North Louisianians seem clueless. News and background from the art worlds of Lafayette and New Orleans is not commonplace here. 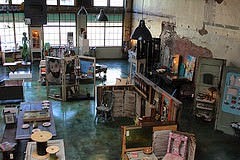 SRAC brought artists from New Orleans' Jonathan Ferrara Gallery to Artspace in the post-Katrina period. And art enthusiast Rebecca Hudsmith brought a number of Lafayette-based artists to Shreveport when she operated Bistineau Gallery, her Market St spot. One of the easiest and best sources of who's who in the southern half of the state is the La Endowment for the Humanities. The magazine Cultural Perspectives is a hugely important publication. LEH director Michael Sartisky is a superb guide to what's happening in Louisiana. Otherwise, there's little buzz and there seems little curiosity about who's who in Louisiana art away from Shreveport-Bossier. I hate to say it, but I've been part of the problem. Writers have the ability to broaden the agenda. We need to fight parochialism. Recognizing Elemore Morgan, Jr's importance to Louisiana represents a start. Says new manager Noma Fowler-Sandlin of the Shreveport Farmer's Market at Festival Plaza, "We have a ukulele band (The Strumdingers) playing at the market to accompanying you while you buy blueberries and sweet corn, both of which are hitting their peak. There's an amazing array of delicious veg right now, and all sorts of other goodies from pasta to pies. And don't forget -- Our tomatoes don't have cooties! Parking will be a little tight because of the workmen (doing a project in the adjoining offices on a Saturday, even) but there's more parking behind the old depot, and in various lots nearby. Don't forget your cash and tote bags. I'll see you there." Beam me up to Manchester, Tn, this weekend, so I might relive my salad days at the Bonnaroo Music & Arts Festival. 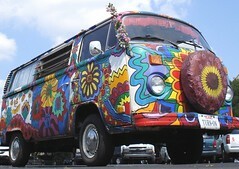 The line-up is dominated by bands in the mold of the Grateful Dead: eclectic, improvising, causing widespread dancing. One stage is devoted to the music of New Orleans. 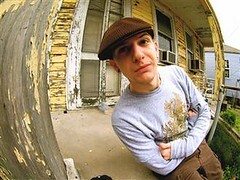 And among the performers is Shreveport-raised music producer DJ Quickie Mart, aka Martin Arceneaux. Since I won't be there, I'll watch a bit of the fest on streaming video and imagine myself flowing amongst the latter-day hippies, once again imbibing the juice of utopian dreams. A muse normally inspires the artist. This time the artist, pastelist Alice Cody, is the muse. Saturday is the debut of the Ark-La-Tex Open Air Art Show. Ralph Cody created the venue for his wife Alice and other area artists. He’s expecting around 20 artists to vend their work under the shade of the covered parking area at the Credit Bureau of the South. Ralph is retired from the Air Force. But during his career travels around the world he enjoyed visiting the open-air markets. “I saw the need for a place for local artists to show their work,” said Ralph. That is how this downtown grass-roots effort came about. Members of the Shreveport Pastel Society, The Shreveport Art Club and West Edge Artists’ Co-op plan to show their work. Free to artists and the public. Artists need to bring their own displays. Join us Sunday, June 29 at 2:00 pm, says Chris Jay, for the next installment of the La Scala Opera Series at the RFC, featuring Richard Wagner’s “Tristan Und Isolde.” Tickets are now on sale exclusively at The Robinson Film Center box office. Our first opera presentation, “Aida,” was a smash success; please help spread the word about this unique opportunity to experience performances by one of the world’s finest opera companies. All tickets $15.00; no passes. Dixie Gin Trade Days will take place at the old Dixie Cotton Gin on the corner of Hwy 3049 and Sentell Road, 7 miles north of Shreveport, says Lauren Murphy. Says Neecee Blackwell of West Edge Artists Co-op, "They've taken an old cotton gin north of Shreveport and fixed it up to serve as an events center. They are putting on this show in conjunction with the Sunflower Trail Festival, where many folks drive up the "trail" (highway) to see fields upon fields of sunflowers." -new handbags, gifts, children's items, candles, etc. -petting zoo and lemonade provided by our "future farmers." 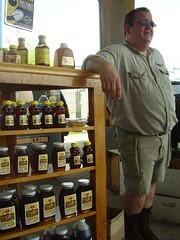 -animals from the Critter Co.
-Live blacksmithing shows all day. 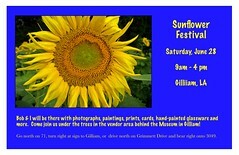 After visiting the Gin, make your way up the sunflower trail to the Sunflower Festival in Gilliam. 10 x 10 Booths are available. The Gilbert & Sullivan Society announces the musical production Big Willie Style: Port City -- an original production featuring scenes from Shakespeare’s plays, blending the bard’s genius with the finest in Hip Hop music and dance, says John Godard. Performances in Shreveport are scheduled at Marjorie Lyons Playhouse on June 19-22 & June 26-28 at 7:30 pm and June 29 at 4:00 pm. Music director is James Palmer. Stage Directors are James Palmer & John Chambers. Choreographer is Wanetah Walmsley. Big Willie Style: Port City will be the fourth production of a series of acclaimed productions originally produced and performed at Northwestern State University under the direction of James Palmer. Scenes and monologues from Othello, Hamlet, Titus Andronicus, Much Ado About Nothing, A Midsummer’s Night’s Dream, Macbeth, The Tempest and more of Shakespeare’s works are presented in tandem with introductory Hip Hop lyrics & dance that explain the significance of Shakespeare’s words in terms that are accessible to a modern audience. High energy, cutting-edge cool theatre that you don’t want to miss! Performers in the show include James Palmer, John Chambers, Wanetah Walmsley, Harvard Taylor, Kent Jude Bernard, Christina Diaz Taylor, Courtney Herron, Chelsea Liles, Luke Sexton, Emma Busi, and Michelle Loridans. Markley & Balmer are an indefinable duo, says their record label, who blend jazz, folk, pop, bop and the occasional polka into a stimulating mix for your listening pleasure. Countless recent studies have coalesced around the same conclusion: Participation in the performing arts is changing drastically and, in many cases, declining. Thus it says an article by John Wenzel in the Denver Post entitled "How can Arts survive in increasingly digital world?". Fewer people are going to operas, plays and dance performances, according to the federal government's Survey of Public Participation in the Arts. That decline is even more pronounced among 18- to 24-year-olds. Most arts organizations agree that a strong participatory culture is necessary to keep them relevant, but the "attendance-only" definition of "participatory" may be in need of an update. And, no, adding a robot conductor to your symphony won't do the trick. "We need to be in the public psyche and at the dinner table conversation, not plugged-in and plugged-out," said Gibson. "I happen to think that art and culture are rights of citizens, but instead of setting the climate for debate in our field, we're reacting to the position we've been put in." The Denver Post presents success stories to balance the somewhat gloomy overall picture. Found the lead to the story at an essential online stop called ArtsJournal.com. One Book, One City: Shreveport on the Same Page; got a suggestion for that one book for this year's program? One Book, One City is a nationally recognized program in which communities participate in book discussions and other events centered on the same book, says Ivy Woodard-Latin. adult literacy and an awareness of books as an experience everyone can share. It encourages the very thing you want neighbors to do: talk to each other to build stronger relationships. White, provided a point of historical interest. The title for this year has yet to be chosen. If you've got a suggestion, mention it to personnel at a branch of Shreve Memorial Library. bookstores will also offer the title. The City of Shreveport, thanks Mayor Glover, et al, and Pratt Industries have delivered a new day to the old town. 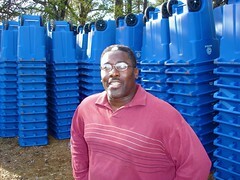 It's called single-stream recycling and you'll read all about it at: justcurbit.us. Listening to the new album by Brian Blade and the Fellowship from the samples at myspace.com/brianblade transports me to a joyous place. The melodies are magnificent. Blade and fellow composers in his sextet have found a compositional comfort zone between jazz, pop and folk that uses modern jazz as the lingua franca. Before and after the relatively predictable sax-guitar-piano crescendos are distinct, lyrical passages based on bold melodies. Listening to the 8-minute exuberance called "Crooked tree" I can tell that I will find new elements of richness with each listening. But the tune that makes me shiver is called "Stoner Hill." The melody is stately, elegiac, perhaps, but most of all the melody arches across an emotional space. It is Blades' "Bridge over troubled waters." I would have called the tune "Greenwood Road," because I can see a lengthy journey down a tree-lined highway past rolling hills. But "Stoner Hill" it will be. 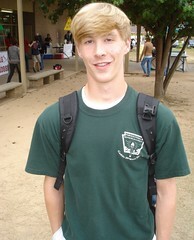 When he was a teen Blade attended Caddo Magnet High, and I know he had a good time in the artful environment built on Stoner Hill by the Magnet community, which included the Blade family. See more on Blades' recent music at NPR.org. Find out more about Blade and the Fellowship and order the album at brianblade.com. 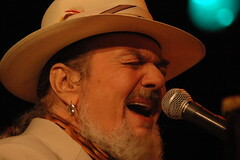 Dr John not happy with state of New Orleans today on new album "City that Care Forgot"
Jon Pareles, NY Times music writer, says, "Mac Rebennack, the 67-year-old New Orleans pianist, guitarist and songwriter better known as Dr. John, carries the city’s lore in his fingers, his scratchy voice and his memory. He has lived in New York City and on Long Island since the 1980s, but when he revisits his birthplace it’s as if he never left. New Orleans culture, he said in his ever-surprising vocabulary, has “wacknosity” — things only New Orleanians do." In New Orleans style, the bad news arrives with a backbeat. Dr. John and his band of New Orleans musicians, the Lower 911, come up with easy-rolling grooves: funk, blues, gospel, even a tinge of zydeco. Sample 4 of the new album's tracks at the NYTImes. 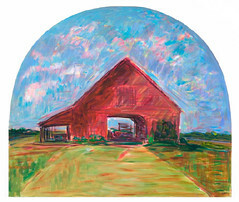 Alan Flattmann, celebrated pastel artist of New Orleans, will give a free demonstration on Sun, June 8, at the Barnwell Center, says Freda Powell. The demonstration will last from 2 to 4 pm and refreshments will be served. 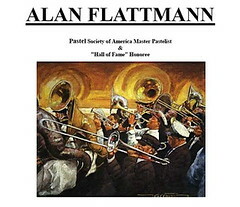 Spanning a career of over 4 decades, Alan Flattmann is recognized as one of America's most outstanding and gifted artists, says his web site. He was inducted into The Pastel Society of America’s “Hall of Fame” in 2006 and awarded the PSA Master Pastelist distinction in 1991. In conjunction with the publication of the book, “Alan Flattmann’s French Quarter Impressions”, the mayor of New Orleans, C. Ray Nagin, officially proclaimed September 28, 2002 as Alan Flattmann Day in recognition of 25 years of success painting in the French Quarter. Someone's in the Kitchen at Artspace has been a successful series produced by Bonne Summers and the Shreveport Regional Arts Council staff. We live in an era in which writers and bon vivants spend a lot of time waxing upon the art of cuisine. So it's good that an art house known for paintings and sculpture can break from its routine to salute chefs and artful themes in cooking. Chef Justin McDonnell has been cooking with his dad since childhood, he says. 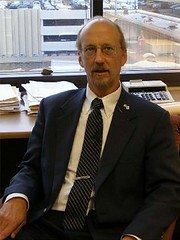 He later studied under Elizabeth Dixon at Bossier Community College. "Food is the only way I can express my artistic abilities, says McDonnell. "Every day that I get to cook, I'm an artist." 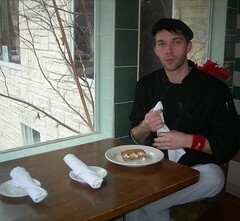 "Charcuterie - with a twist" is the theme of the supper he'll present Tues at 710 Texas St.
$75 per person. Only a few seats left, says Summers. Diff'rent Strokes is the Karpeles Museum exhibition for the month of June, says Jean Glabus. 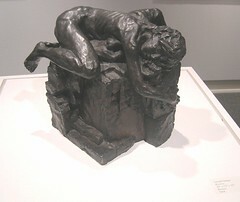 It features prints, drawings, watercolors & sculptures by the highly-accomplished Gerald Ortego. Gerald is a free-lance artist and a Caddo Parish art teacher - he teaches in the Talented Arts Program. He has won numerous awards in national and international shows, notes Glabus. The opening reception is Sat, June 7, between 1 pm and 3 pm at Karpeles Manuscript Library Museum, 3201 Centenary Blvd, Shreveport. La Dance Theater, celebrating its 25th season, has a blow-out Saturday coming up, says Carol Anglin. It is a day of workshops that begin at 9 am and go to 5:30 pm. At 6 pm a studio performance will be presented. 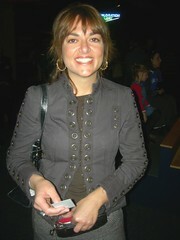 2008 Michael Award recipient in NYC." points out Anglin. Saturday at Carol Anglin Dancenter at Pierremont Mall," adds Anglin. Ballet will be taught by Ceyhun Ozsoy and modern by Grambling professor Dianne Maroney-Grigsby. Student fees are $50. Observers are $20. From 5:30 to 6 there will be photos with faculty and at 6 pm, a much-awaited studio performance. "Wanted to let you know that photographer Keith Carter picked my photo "Reddy's Nose" to be included in the exhibit mentioned below. This is an honor for me and wanted to share this with my friends in Shreveport! Hope you can make it down! The exhibit is up through July." Critter Fest is Saturday, June 7th, 2008 1 pm - 6 pm at the 1100 block of St. Mary Street (at Magazine Street). Free Fest, Dogs and Cats Available for Adoption, Pet Microchippping, Critter Vendors, Pet Photos, Animal Hurricane Preparedness Information, Live Music, and Fun. The inspiration for Critter Fest is the art exhibit Critters opening the same evening. The New Orleans Photo Alliance is pleased to announce our next exhibit Critters: Juried by Keith Carter. 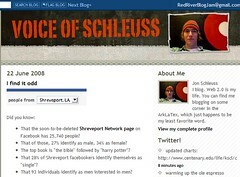 Btw, the Shreveport Dog Park petition and cause has been taken up by Cynthia Keith. Teens 13 to 15 who want to continue their art education have summer workshops being offered by Friends of the Barnwell, says Freda Powell. “An Interactive Adventure through the Arts” will consist of four three-week workshops and a one week session teaching an Introduction to Photography, Printmaking, Beginning Drawing, Chalk Art, and Mosaics. Each class will be taught by a professional artist. Instructor Michael Phillips will teach Chalk Art June 24- July 15, Tuesday- Thursday from 10am- 12pm. Creating one-of-a-kind chalk masterpieces using color from the color wheel will be the focus of this class. The focus will also be creating public art on the sidewalks surrounding the Barnwell Center for visitors to enjoy. An introduction to photography will be taught be Denise Elmore. The class will teach the basic concepts and techniques to take your photographs from ordinary to extraordinary! The photography class will be held June 24- July 15 Tuesday- Thursday from 1pm to 4pm. Necee Blackwell will teach printmaking July 15- July 31, Tuesday – Thursday from 10am- 12pm. Graphic design and commercial art concepts will be taught to create your own designer T-shirt. The instructor will teach participants about the wide range of materials and the diverse techniques associated with screen-printing and printmaking. Blackwell will also instruct a beginning drawing class that will teach you “How to see Like an Artist”. This beginning/ intermediate drawing course will teach you to draw what you see and to view everyday items and images with a different eye. The drawing course will be taught July 15- July 31, Tuesday – Thursday from 1pm- 4pm. A one week course on mosaics will be taught by Anita Goodson. The class will be held August 4- August 7 Monday- Thursday from 1pm- 4pm. 318-673-7703 for additional information and supply lists. Pre-Registration is required. Tarumbae, aka Ron Hardy, presents them at his H&H Performing Arts Center, Wed, June 4. The H&H is adjacent to the former Freeman's Restaurant on the corner of Milam and Hope Streets. And said oooh eeeh daddy I understand. And around the corner an ice wagon flew. Who do you love, Who do you love, Who do you love, Who do you love.